RETIRE IN STYLE BLOG: Internet Tendency: This is what Perfect Blog Posts looks like. Internet Tendency: This is what Perfect Blog Posts looks like. Poor man was having a bad day! 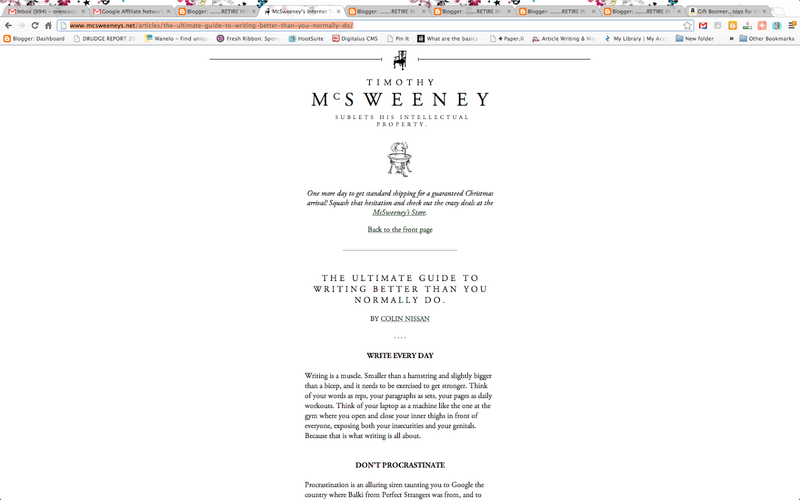 note: A special thanks goes out to Timothy McSweeney's Internet Tendency...really funny stuff! I read about a guy today that had just bought a new iPad and wondered why he was not happy, content and filled with the Christmas Spirit. Actually he kinda hated his life! Poor man. His name was Sam Weiner and the article title was Something is wrong with my iPad. I still hate my life. Now I wish I had thought of that title yesterday when I was writing the daily blog post. I have a long way to go before I actually know what I am doing. When I read Weiner's article, I knew that in the writing business there are some people that simply shine. I stumbled on the website at StumbleUpon. Someone had recommended The Ultimate Guide to Writing Better. So, if you want to see what REAL writers have to say go Internet Tendency. Bookmark the link and start learning! Interesting blog. I found you through rescue alert of california. thank you for stopping by Lisa. Excellent article AND I bookmarked the other link, just as you suggested. I've been reading your blog on Google reader but now I am officially your newest follower. I am inspired to write more this year. I will participate in at least two writing challenges this year.